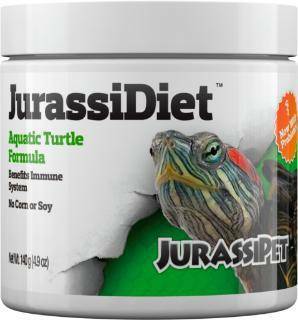 JurassiDietÂª is THE premium food for aquatic turtles. It contains only the highest quality ingredients without low nutritional value fillers (like corn meal). It contains a broad spectrum of all the important components needed in an aquatic turtle’s diet: protein, fat, carbohydrates, vitamins and minerals. JurassiDietÂª is different from other foods on the market because of its nutritional value and palatability. You will see increased growth, appetite, coloration, and vitality in your animal within 1 month of constant usage of JurassiDietÂª. GUARANTEED. JurassiDietÂª costs more than other aquatic turtles foods because of its superior formulation and quality ingredients. Contains no soy, which can interfere with calcium adsorption. Ingredients: alfalfa, krill meal, fish oil, fish meal, spirulina, beta carotene, Vitamin A Acetate, D-Activated Animal-Sterol (D3), Vitamin B12, Riboflavin, Niacin, Folic Acid, Calcium Pantothenate, Pyridoxine hydrochloride, Thiamine, Biotin, DL Alphatocopherol (E), L-ascorbyl-2-polyphosphate (C), choline chloride, cobalt sulfate, copper sulfate, ferrous sulfate, manganese sulfate, ethylenediamine dihydroiodide, mineral water. Guaranteed Analysis: Crude Protein (min): 35% Vitamin A (min): 8000 IU/kg (3600 IU/lb), Crude Fat (min): 7% Vitamin D3 (min): 450 IU/kg (205 IU/lb), Crude Fiber (max): 5% Vitamin E (min): 200 IU/kg (90 IU/lb) Moisture (max): 10% , Ash (max): 9% DIRECTIONS: Feed daily as much food as the animal will consume in one feeding (1 hour).